Fire fighting, in days before the modern equipment in use today, was a very different affair. For the real advance in organisation and technology we have to look at the Victorian fire brigades in the early days of her reign from 1837. 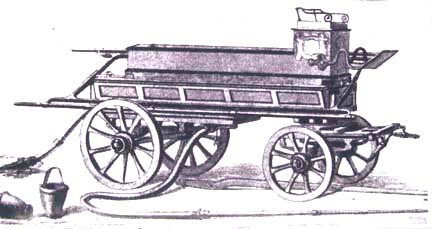 In this era the only means of transporting the manual engine to the scene of the fire was either the horse or by man power. Usually the manual fire engine was operated by members of the public who volunteered their services in return for payment. 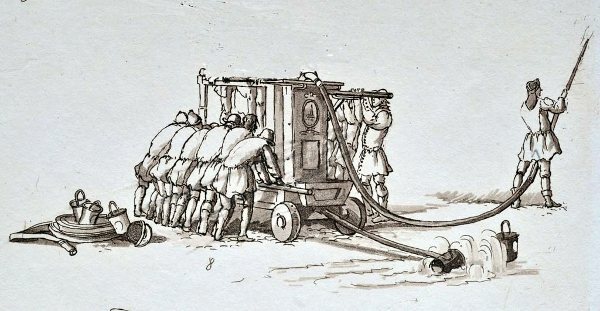 They were generally referred to as ‘pumpers’ and were placed evenly on either side of the pump using long handles to move the water onto the fire. They were paid (not always that promptly) by the respective insurance companies of the properties involved the sum of one shilling (5p) for the first hour and sixpence each hour thereafter. A Hadley, Simkin and Lott manual fire engine operated in this case by twelve men, drawing water from the main. On the larger manual engines there could be as many twenty either side. In London, as these companies became more popular and in an attempt to reduce their overheads and increasing claims they enticed a successful Chief Officer from his native Edinburgh down to the Capital. His name was James Braidwood and his task was to take control of the five insurance companies, and together set up the London Fire Engine Establishment in 1833. They were the Sun Fire Office, the Phoenix, the Royal Exchange Assurance, the Atlas, and the Union Fire Office. Each of these companies still ran independently of each other, with their own manual fire engines, livery and badges. Replicas of these badges had been used and became known as firemarks, which were placed over the doorways of the premises insured by that company to both advertise themselves and indicate that their fire engine crew could ensure they had the right premises, as street names and numbering were not in use at this time. 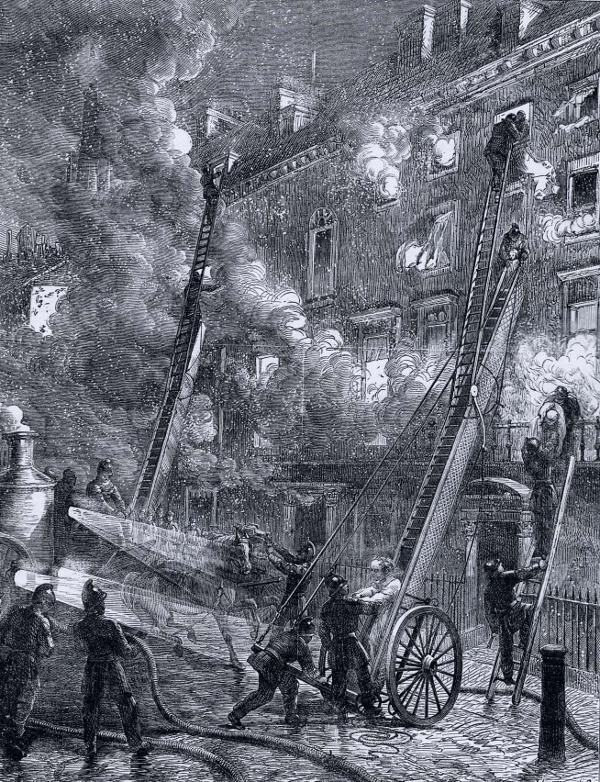 Over the next few years, Braidwood’s London Fire Engine Establishment, successfully achieved his original objective, to the great satisfaction of his employers but concern was growing between the inhabitants. Their concerns were centred round the increasing loss of life at fires, mostly at night and by people trapped on upper floors without any means of escape. No real emphasis had been seriously considered concentrating on the saving of life but now this resulted in the birth of the Fire Escape Society in 1828 later to become the Protection of Life from Fire, in 1836. The following year Queen Victoria agreed to become its patron but even with its Royal prefix, success was slow and after considerable re-organisation finally achieving a satisfactory conclusion in 1843. This shows fire escapes at the scene of a fire in the early 1900’s. In general they worked well with Braidwood’s LFEE and very soon had fire escape stations all over London, approximately at half mile intervals but only manned between dusk to dawn. The director of each station, also called a conductor, would enlist three spectators to man-handle the heavy ladder through the streets to the scene of the incident. A wheeled escape was designed later in 1837 by Abraham Wivell. To qualify for payment the crew must return the ladder back to the station. To operate successfully, the Society relied totally on voluntary contributions. Margate’s first horse drawn fire engine delivered in June 1878. The horse played an extremely important part in fire brigade life in the Victorian era to pull the fire engine and was eventually trained for that specific role and no other. They had to have a certain temperament and should only be used to pull the fire engine. In the early 1860’s, in order to keep down costs within the Borough of Margate, it was recorded that the fire engine had to wait for the horse of a mounted policeman or the milk cart to return before proceeding to a fire. Even then, if the poor animal had been on the boundary of the Borough, by the time it had been alerted by the maroon and galloped to the fire station it was in no fit state to pull the engine and crew, resplendent in their brass helmets on to the fire. If a trade horse was on its ‘own patch’ for example, following its daily routine, it might have finished up outside a house where it often received a tasty carrot from a kind customer! DID THE ROMANS LAND NEAR EBBSFLEET?